The Chinchorro mummies are quite different from the traditional linen-wrapped mummies of Egypt that we often equate this the term ‘mummy’. Recently, these mummies from Chile and Peru have become the new poster children warning about the effects of global warming. These mummies that have been preserved and protected for 1,000s of years are beginning to decay due to the increased moisture in the atmosphere. Those that are protected in museums have decayed at a slower rate, and those that remain in their desert graves are deteriorating at a rapid pace. These individuals were preserved with the thought that this would provide them with an appropriate send-off into the afterlife. The mummies came about around 5000 BCE as a response to changes in climate; so it is sad now that another change in climate is causing them to deteriorate after 7,000 years of preservation. 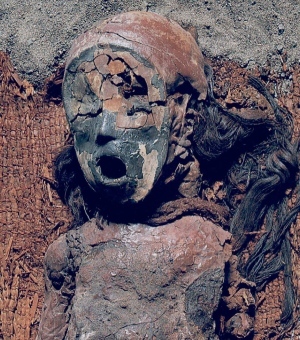 The Chinchorro people of Chile and Peru began artificially mummifying the dead around 5000 BCE (2,000 years before the Egyptians began doing it). In 2012, research was published by Marquet et al. that argued that the creation of artificial mummies was due to changes in climate. They proposed that in 7000 BCE the desert environment became more arid, and the Chinchorro people noticed that bodies that were buried in the arid desert without any treatment became preserved by the heat and sand. In this type of climate, bodies dry out and preserve because the bacteria that helps break down the remains can’t survive in those types of conditions. In response to these natural changes, the Chinchorro began to produce their own mummified remains as it may have been seen as the appropriate method of disposal. The deceased would be elaborately prepared by removing the internal organs, filling the body with vegetable fiber and animal hair, then removing the skin and replacing it would a thick coating of clay. There were different methods of preparation depending on the time period. During the earliest period of artificial mummification (5000 to 3000 BCE), the body would first be disassembled, the skin would be removed, and the remains would be heated to remove moisture. Afterwards, the body was reassembled and gaps in the remains were filled with grass, ash, animal hair and more. A clay paste was used to create a skin like coating, and was molded around the face to create facial features. The body would then be painted with black manganese to give it color. The second method (2500-2000 BCE) involved removing the internal organs to allow the inside of the body to dry, and cutting off the head to allow the brain to be removed. The body would then be put back together, and the cavity was packed with various materials to strengthen it. Like the earlier method, clay was used as a skin like protective coating, and the individual was decorated with a wig and red ochre paint. The final period (3000-1300 BCE) led to the use of various colored clays when preserving the body, which added a colorful look, aided desiccation and covered up the smells of death. Organs were left in the body, but were covered with mud, sand and some type of glue to prevent decay. The Chinchorro mummies were first discovered in 1917, and since then hundreds have been discovered. What makes this mummification process so unique, is that everyone who died within this culture during this period was mummified, unlike Egypt where mummification was used only for the highest status individuals. Chinchorro mummy showing signs of decay- black bacterial ooze. via Livescience. Now however, changes in climate are causing the Chinchorro mummies to decay. Research released by Harvard University’s Ralph Mitchell and Alice DeAraujo (2015) investigated why these mummies had survived for thousands of years and then suddenly began to change. They examined the mummified remains, and found that there was bacteria present on them. This bacteria was placed on pig skin (a surrogate for the mummified skin so as to prevent destruction to the archaeological speciumen) and then was exposed to varying degrees of humidity. It has been argued that the dry climate of the Atacama desert where these mummies were found prevented bacteria from breaking down the remains. Mitchell and DeAraujo (2015) found that increased humidity led to faster breakdown of the sample skin. In this region of Chile and Peru, environmentalists have reported an overall rise in humidity and air moisture due to climate change. Since the museum whereMitchell and DeAraujo are studying the mummies is also in this region, it isn’t a surprise then that the mummies are effected. Those mummies still in their burials are faring even worse, and breaking down at a faster rate. Climate change led to the creation of these ancient mummies, but now climate change is causing this important piece of cultural heritage to decay. Hopefully, future research will help determine a way to stop the decay and protect these mummies from further damage. The remains of these individuals can tell us so much about the Chinchorro culture, and we could lose this information forever if this decay isn’t stopped.